My husband always wanted a big, full beard. Unfortunately, he’s known as a hairless wonder and currently sports even less hair than I do (pregnancy hair, eeeeks!). While I love the lack of hair, he’s always told me that he wants a big big beard. 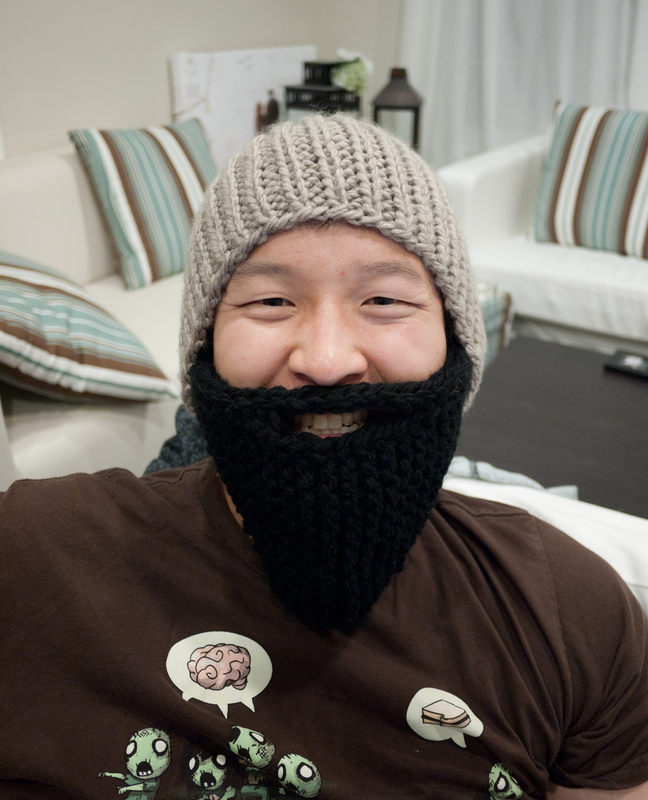 So when I came across a beard-beanie on pinterest, I just had to make one for him! I used bulky acrylic yard with US13/9mm sized needle, and the fit seems to come out fine. I was really hoping to use wool/cotton, but wool is scratchy, and there’s no bulky cotton at the store. But my husband wants to wear this to snowboarding as well, so acrylic was a much better choice than cotton anyhow! This entry was posted on Thursday, October 13th, 2011 at 9:46 am	and posted in finished pieces. You can follow any responses to this entry through the RSS 2.0 feed. hahahaa, i thought he looked like gnome! That is seriously funny. I think my brother may want one of those.